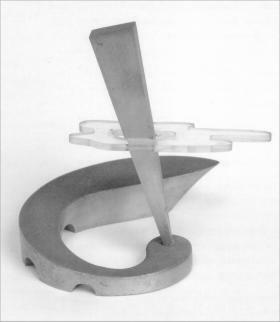 First Sculpture, 1947. Wood, perspex. Image copyright Effy Alexakis 2002. I studied Engineering Technology - that's what we used to call it then; nowadays we call it Chemical Engineering - at Sydney University. After graduation I worked as an Assistant Engineer at Colgate Palmolive. My parents decided on engineering because that was the closest to what I was doing at home. Perhaps that wasn't the right decision ... but one doesn't talk about 'what ifs'. And being an engineer has been a great help in what I did later: I wasn't just an artist. During that time I started to do what is now called 'sculpture'. In those days I don't know what I called it: I just liked making these things. The scene for sculpture was very grim. People thought I was crazy. My mother would say, 'What's it supposed to be?' and people would scratch their heads. But I think now they were quite good sculptures for someone who was barely twenty. In London, where I arrived by ship in 1950, I had to earn a living so I didn't have time to do anything big. But some of those miniatures I did then could be turned into something quite large even now. London was fantastic. I met Trudy there at the same time as the Festival of Britain and got engaged. Oh, London was wonderful! I think it must have been at its peak. The Festival Hall was going up, and there were Henry Moores and Barbara Hepworths all over the place. I was immensely inspired by them.